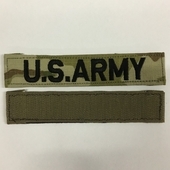 This item is one official Scorpion W2 OCP name tape for the Army ACU (and all Military branches using the new OCP) embroidered with "U.S. ARMY". If another branch is needed, please use the item form for CUSTOM OCP Name Tapes. All official name tapes are made to order and usually ship in 3-4 business days from when they are ordered. These Scorpion W2 OCP name tapes are made for official wear on the U.S. Army Combat Uniforms (ACU). These Name tapes have a hook and loop style back, but can also be ordered as sew-on.